I dig cloth diapers. 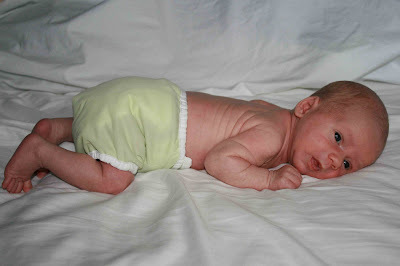 This is a picture of Alex in his cloth diaper bottoms. At our house, we are digging the cloth diapers and wipes! Now before you think that I am spending my days washing out dirty diapers, let me confess that we are using a cloth diaper service here in Des Moines. The service provides us with a cloth diaper bin and liner (complete with a secure lid to keep the smell in), clean cloth diapers each week, and a front door pick up of our week's worth of yucky diapers. How fabulous is that? 1. I love that Alex always has soft, breathable cotton on his bottom. The diapers don't use pins, they are just folded and kept in place by a Velcro-fastened diaper cover. Changing his diaper is definitely just as easy as changing a paper one. 2. We are saving money by using cloth...and who doesn't like to save money? 3. Alex never has diaper rash. This was listed as one of the main incentives for using cloth in many articles I read before, and I'm glad to report that it's true. 4. The cloth wipes work just as good as the paper ones and it makes me feel good that I'm not throwing away something every time I change his diaper. 5. When we were researching this option before Alex was born, I saw some statistics on the amount of waste paper diapers create. I was truly shocked. Did you know that the average kid will use about 8,000-10,000 diapers before he's potty-trained? Americans throw away 570 diapers per second - about 49 million a day. And all those diapers will still be in the landfill 300 years from now. Oh my! 6. I've read in lots of places that kids who are cloth diapered potty train up to 12 months sooner than ones who are paper diapered. Of course, it'll be a while before I know if this one is true, but the thought of it sure is appealing. I know that everyone makes their own decision about what's best for their baby, so please don't hear me say that you should all be cloth diapering your babies. But, I think it's responsible to at least consider it in these days of thinking seriously about how much we consume and waste in America - and the cost of it all. At the very least, maybe read an article or two and see what you think. ...then you will fall into that "real deal" category of pure cloth diapering moms. You're in good company there. I have a question about cloth diapers. What do you do when you travel or leave him in a nursery? When we travel or go on a day outing, we use disposables. There's just not many ways around it. I don't want to carry around dirty diapers and most nursery workers prefer the convenience of disposables. Often times Alex will be wearing the cloth and we'll have to leave to go somewhere. I'll just pack a plastic bag in his diaper bag so that when I change him we'll have somewhere for his cloth diaper to go (sealed up in the plastic bag till we get home). Then we'll put him in a disposable. Thanks for the info. Hope you guys are having a blast being parents. Believe it or not, it only gets more fun!